IM Western Australia has 1m+1f + 2 floating Pro Kona slots. (The floating slots are proportionally assigned to the male and female Pros according to the number of Pro starters.) It has a total prize purse of 50.000 US$, paying 8 deep. Because of a shark warning shortly before the race start, all athletes had to leave the water and the swim was cancelled. The race was started “just before T1” in a time trial fashion to break up big groups. Of course this changed the dynamic of the race: Looking at the times it seems that the bike was quite a bit faster than what’s “normal” for Busselton (adjustment would have been around 26 minutes, compared to the course rating of 14:13), probably because everyone was trying to move into a good position after the time trial start. The harder bike probably contributed to a significantly slower run (-6:33 minutes, compared to run course rating of 1:10). This is reflected in the run times – there were only two sub-3 marathons on the men’s side (by Terenzo and Cameron Brown) and the fastest female run split was a 3:09 by Camilla Borg. The change in dynamic resulting from not having a swim makes it a bit hard to ask how the race would have panned out if there had been a swim – after all athletes could have paced more sensibly or a faster swimmer but slower bike rider could have keyed off a slightly slower swimmer and better bike rider. With that caveat, as far as I can see the swim wouldn’t have changed the overall results too much: Terenzo should have been one of the fastest swimmers, so he still should have been able to defend his title. Carrie might have swim slightly slower than Mel, but it’s hard to imagine how that could have resulted in a seven minute difference at the end. Adding in expected swim times, Mel Hauschildt could have been able to set a new course record (she could have swum around an hour while I expected her to swim around 55 minutes). Carrie would have likely finished sub-9 and Terenzo’s time would likely have been sub-8 (but probably slower than his 7:51 course record from last year). In the results below I have also added a rough estimate in the “Diff to expected” column comparing each athlete’s performance on race day to their previous results (if available). Terenzo Bozzone (8.750 points) is safe for a July slot, as are the top female finishers Mel Hauschildt (6.285) and Carrie Lester (6.480). Mareen Hufe (4.775 points after her sixth place) can also plan for Kona 2018. Tim Berkel is on the bubble for a slot, at 3.455 points he’s right at the projected cutoff number. He already has four races in his total, so improving his total won’t be easy. Dougal Allen has improved his total to 2.240 points, he’s in a good position to secure his slot early next year. Should Yvonne Van Vlerken (2.960) decide to try to qualify for Kona again, she should also be able to secure the remaining points. IM Western Australia is a P-2000 race. It has a total prize purse of 50.000 US$. 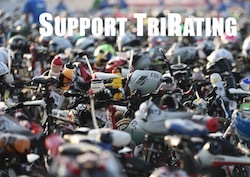 The strength of the field is 16% of a typical Kona field.